At its 40,000 sq ft Demo and Training Centre in Sant Cugat del Vallès (Barcelona), Hewlett-Packard (HP) presents its customers with the latest digital printing technology, from large-format printing to packaging and job printing. Every year, over 6,000 delegates from the EMEA region visit the Centre to seek inspiration and participate in training. Customer Centre Director Ester Chiachio: “We view ourselves as a ‘Dream Factory’ that fosters new ideas and demonstrates how to turn them into reality with modern printing techniques.” Since 2013, DRAABE has been keeping air humidity on the right track at HP as an accredited specialist. 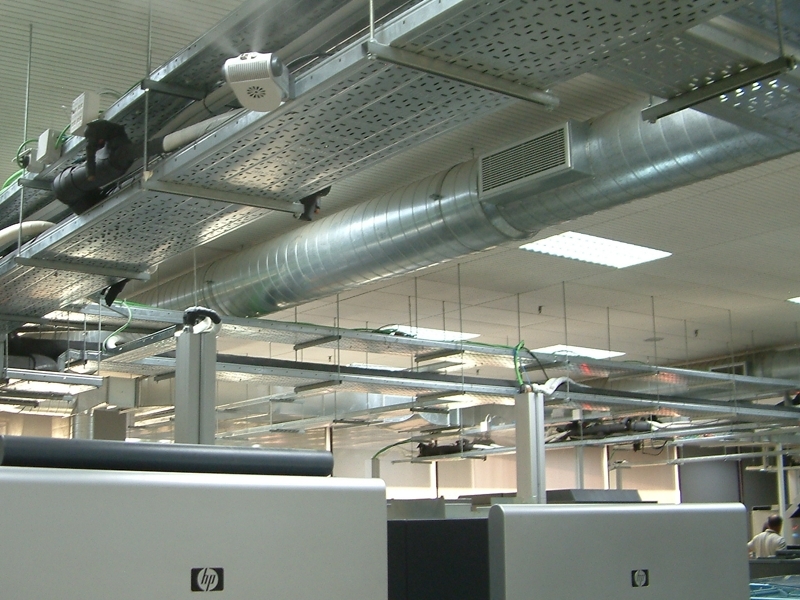 To ensure optimum results for print and production, the HP Demo and Training Centre requires air humidity values to be kept constant. “Electrostatic charges, changes to the paper dimensions and fluctuations in print quality all adversely influence our training and demonstration work,” explains Adam Goldthorp, HP Training Manager. “In addition”, says Goldthorp, “the various printing technologies and materials (e.g. plastic, cardboard) will also need different air humidity levels for processing.” Our existing centralised ventilation system with steam humidification was no longer able to handle the requirements and was shut down in 2013. Optimised air humidity protects from electrostatics in digital printing. Do you have questions about DRAABE air humidification in your print shop? We can gladly reserve a no-cost appointment for you.